It is already Easter so I had to bake something seasonal. Let’s go for a nest with some chocolate eggs! Mix the cocoa powder with the boiling water. In a bowl, mix the egg with the sugar. Add the vanilla extract and a quarter of the chocolate mixture. Then add the flour and baking powder. Stir well and add the melted butter and the rest of the chocolate mixture. Once the mixture is well combined, pour the dough in cupcake moulds. Once baked, let the cupcakes cool completly. For the butter cream, mix all the ingredients together. To make the nests, pour the coffee buttercream in a pastry bag. Use a small star nozzle to create the twigs of the nest. Don’t forget to drop the chocolate eggs in the middle of the nest! 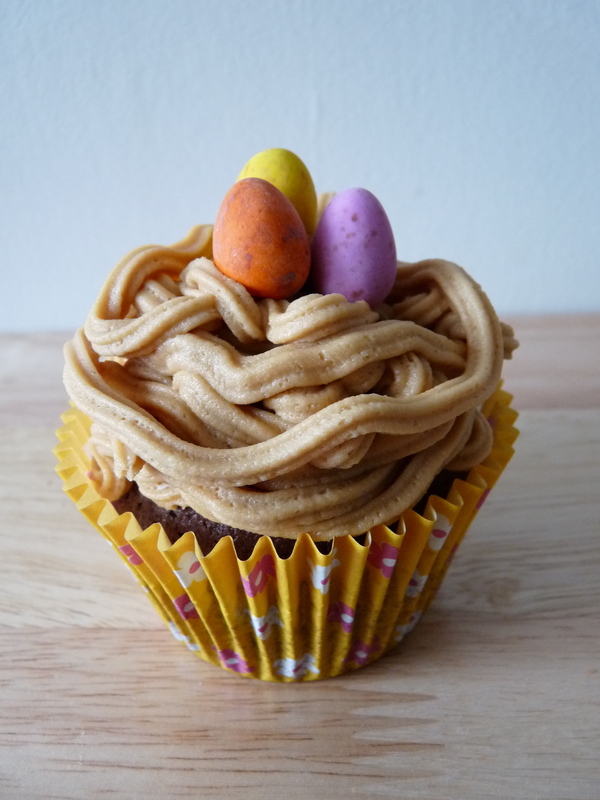 This entry was posted in Cupcakes, Easter, Recipes and tagged coffee, easter cupcake, easter recipe by thebloodyfrog. Bookmark the permalink.